ManageWP for Android Has Arrived! 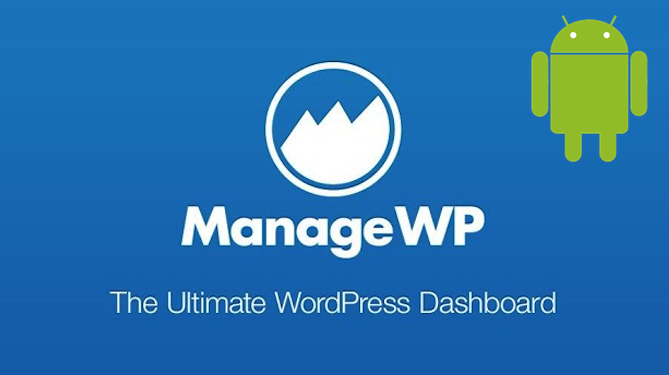 Since we launched ManageWP for iOS back in November 2012 one of the most popular questions we have been asked is, “When will you have it for Android?” Our answer has always been, “We’re working on it!” Far be it from us to exclude Android users from the joy of managing multiple WordPress websites from their smartphones — we just needed to tackle on app at a time. But today I am delighted to announce that the extremely hard and dedicated work of our dev team is about to pay off because ManageWP for Android is now available! Read on to find out what you can expect from the newest addition to the ManageWP family of apps. You’re no doubt familiar with the old adage, “If it aint broke, don’t fix it.” Well, that’s exactly the approach we took to developing the ManageWP Android app. We had essentially already done the hard work in developing the iOS app — the key was in taking that existing framework and porting it over to the Android operating system. 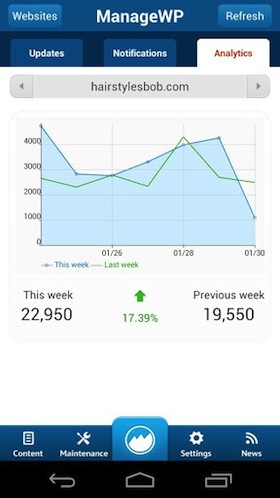 The intention with our mobile apps is to create an experience that in some ways can actually supersede the desktop version of ManageWP and we are confident that we have achieved that with the Android app. Whilst you will still rely upon the desktop version for gaining access to total control of your ManageWP account, the mobile app gives you a way of accessing the most commonly-used features in just a few taps. You’re going to love how much more efficiently you can manage your sites with the app — it’s like finding ManageWP all over again. We’d love to know what you think about our new app so please don’t hesitate to leave your thoughts and comments below. So I assume your May 1st timeline was wrong? The app I have was working but now it won’t even login. Too bad I was liking it. No updates, no info… not a good way to get me to upgrade my account. Maybe there should be some info on the rewrite… a new timeline? Anything?? You have people begging for it but you won’t answer them. Sorry for the lack of updates. We are happy to say that the app is in final beta for the selected number of users. It will definitely launch this month, pending approval from Google and Apple. Guy, the link did’t work anymore..
We pulled it out as we are building a new version (the old one wasnt as good as we wanted it). New version is due out around 1st of May. Is it out yet Vladimir? 1. I had no problem moving it to my SD card, which I really appreciate (gotta save that space). 2. I can’t shut it down. If I hit LOG OUT it exits, then starts up again. If I back out, it shuts down then starts up again. The only way to really get out of it is to go to my Home Screen. Very cool and much appreciated. Thanks a million. I was desperately waiting for this. It has made my task much easier now. Really wanted to thank you for updating the app. I was able to move the app to the SD card. Thank you. The Design Creative have been waiting on this. Thanks Vladimir,it works like a charm !Can’t wait to use it. Thank God, I’m so happy for this. Been a long time coming and seems to work great. This will really cut time even further. Thank you Thank you Thank you. Now all we need is Paypal option. I was eagerly waiting for this, thanks!!!! Thanks Vladimir. It works flawlessly! Let’s just say I’ve been hoping for this for a while now! congrats on your release here guys! NB : the only little fix to be done is when you update a plugin. For example I have right now 6 wordpress managed, 1 of them require a plugin update, when you do the update, the message afterward is telling you the the update was successfull on 1 wordpress and failed on 5 others … which is wrong since we had only 1 wordpress to update ! !